Here are brief descriptions of a few of the hidden gems Southern Utah offers. For more detailed information on how to reach them, google the place names. Remember, we are in a dry climate here, stay hydrated and let someone know your travel plans and expected return time whenever you venture out into the desert. Snow Canyon State Park is only 15 minutes north of St. George, and it is characterized as a “mini-Zion” because of its towering red and Navajo sandstone cliffs, rugged lava fields, and flowing sand dunes. Are you seeking picturesque hiking trails? There are 38 miles of them in Snow Canyon. Equestrian trails the canyon offers 15 miles of trails. Do you want more of a climbing challenge? There are almost 200 climbs within the canyon’s walls. Snow Canyon is a quieter less crowded option than Zion with equally majestic scenery. There are bathroom facilities and parking lots scattered along the paved main road at trailheads and points of interest within the park, and a ranger and interpretive center halfway through. One of the traits that make Snow Canyon a preferred destination is you can explore. Where Zion restricts visitors to narrow paved paths, Snow Canyon affords you the opportunity to strike out across and climb to the top of rolling sandstone hills. Some of the most sweeping picturesque views can only be seen from atop the hills. You won’t be rushed by crowds. You can sit and appreciate the vistas of the park as long as you choose, and when you are ready, move on to the next trail or just to the other side of the hill for entirely different scenery. On the east side of Snow Canyon, in a secret slot canyon. You access the hike from outside the park off highway 18. Follow Bluff Street north and it turns into highway 18. The 2.5 mile, one-way, hike can be accessed from the parking area at the west end of 4200 N. The hike leads into a maze of red rock formations culminating in an ancient patina blackened wall covered with hand-carved ancient petroglyphs. The entrance to the canyon is easy to miss, but worth the effort. Look for previous visitor’s tracks. The canyon walls narrow to about shoulder width and require some scrambling in places, but it is a moderate hike. 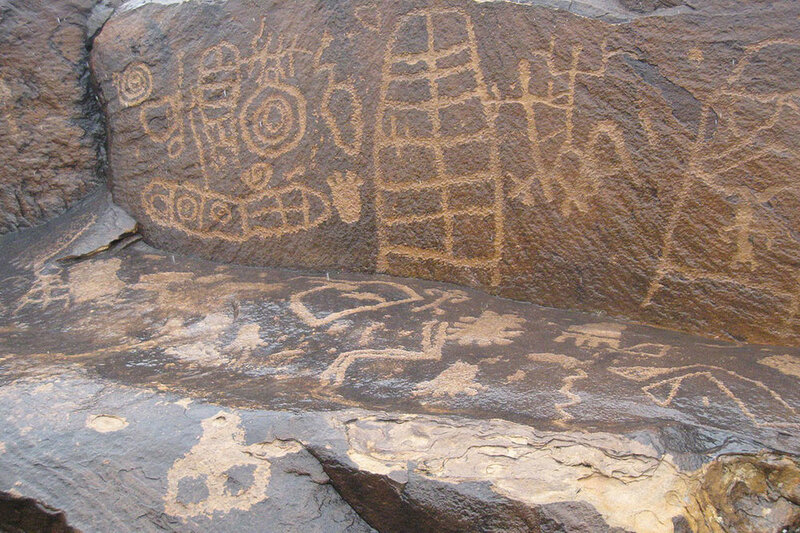 If you enjoy the wonder of ancient petroglyphs, another hike you will enjoy is the Anasazi Trail. The Anasazi Valley, or Tempi’po’op Trail, leads to some spectacular ruins of an old Anasazi Farmstead and well-preserved petroglyphs. The trail is a relatively easy 3.5 miles roundtrip located west of Santa Clara on old Highway 91. Follow Sunset Boulevard west and it becomes Highway 91. There are two trailheads to the trail, the lower is just out of Santa Clara, and the upper is close to the entrance to Kayenta. The upper petroglyphs on this trail are written on the rocks at your feet as you stand at the edge of the canyon split by the Santa Clara River. There are trail markers showing the area of the petroglyphs. You can divide your attention by examining the petroglyphs at your feet and looking out over the scenic canyon and consider what message the ancient inhabitants who carved the glyphs were trying to share. At the west end there are Anasazi Farmstead ruins protected by a pioneer style wooden fence. This hike can really be as long as you want to make it. At the east end, you can head down into the canyon and follow the road along the river. You will find Necklace Rock. A large boulder on the right side covered with petroglyphs with a prominent squash blossom necklace in the center. From here, you will be looking up at the canyon, the opposite perspective from the top, but equally impressive and picturesque. When you leave Snow Canyon via the north entrance, and head north for 1.2 miles, on the right the Diamond Cinder Cone juts out of the valley providing an elevated viewpoint after a short hike. There is a pull off area on the right side of the road that doubles as a parking lot. The main trail loops around the back of the cinder cone then ascends the side of the hill. At the top of the cone, a trail circles the rim of the volcano. On the low side of the rim, a trail leads down into the crater. This trail is volcanic rock, so wear shoes with good soles. From the top of the cone you can see Diamond Valley and into Snow Canyon. The high vantage point provides visitor’s with an overview of the area. Pioneer Park overlooks St. George around the “Dixie” rock on Red Cliffs Drive. The park offers lots of gentle climbing and hiking over red rocks and desert trails. It is an easy access park with paved roads and parking areas. You will find a pioneer “cabin” in the park formed by building a rock wall in between two massive boulders. At one time it contained a fireplace and you can still see where the occupants affixed shelves to the walls. The temperature inside the cabin is often several degrees different than it is outside the cabin. At the rear of the park is a camping and picnic area, and as an Eagle Scout project, the scouts built a bridge connecting the Dixie rock with the rest of the park so you can walk across to see a panoramic view of St. George. The view is particularly stunning after dark. If you go at night, take a flashlight. Red Cliffs Recreation Area is just north of Washington on I-15. There are miles or trails that cover a variety of topography. Red sandstone cliffs, desert sand, the lush riverside of Quail Creek, rolling hills, a pioneer house, and hidden canyons. Among the attractions here are Anasazi ruins, dinosaur tracks, multi colored ridges of Navajo sandstone, and gullies home to a variety of desert wildlife. The trailheads within Red Cliffs start from the BLM campground where there are day use and camping areas. The campground surrounds Quail Creek lined with trees and scattered picnic tables for public use. Red Cliffs is so close you can make this a lunch stop or an all-day adventure. There is a BLM entrance fee to access the area. Cedar Breaks National Monument is up the mountain out of Cedar City. If you want to escape the heat during summer, this is an ideal location. At over 10,000 feet elevation, the daytime temperature are a cool 75 on average. During July and August, Cedar Breaks hosts wildflower days. There are acres of wildflowers that bloom in succession and each week brings new colors. From the lookout at the visitor’s center you can see all the way to Nevada mountains. The rock formations at Cedar Breaks are similar to Bryce canyon but they are more brightly colored and you can hike trails behind the ravines to lookout vantage points along the route. These trails offer magnificent views of the valley and the rock formations within the monument. The day use area is located adjacent to the campground north of the visitor’s center, and the campground offers wide views of alpine meadows and often, grazing deer. If you continue north from Cedar Breaks, you will find Brian Head resort with mountain biking trails, and skiing. Because of its elevation, the campground and visitor’s center at Cedar Breaks is only open from mid June to late September, depending on weather and snow.